With the diesels rapidly taking over at Jingpeng we made one last visit there to bid farewell to what had been the greatest steam show on earth before moving on to Lindong for some more big steam action. A very successful trip to JIngpeng Pass in perfect late summer weather with blue skies, green hills, cold mornings and clear light. A real glint and silhouette spectacular. 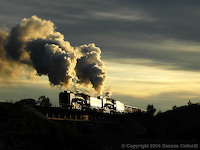 Unbeknown to us at the time, diesels started to work over the pass within a couple of weeks of our visit. We also visited Lindong in poor weather and then trekked north to the excellent Huanan narrow gauge operation. Bryan Acford's report of his visits to Dahuichang, Lindong and Jingpeng in late winter 2004. An all industrial bash covering Tongchuan and its celebrated JFs, Pingdingshan, Nanpiao, Huludao and Tiefa plus visits to the Beijing and Shenyang museums.